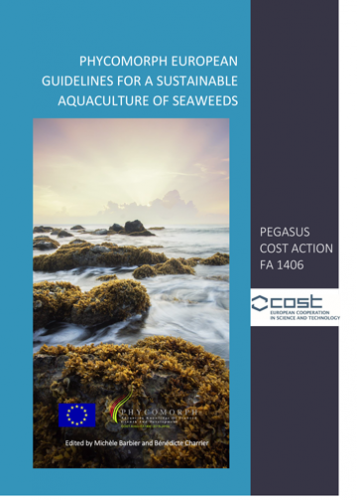 The present Call for contributions intends to collect contributions for the purpose of "PEGASUS - the Phycomorph European guidelines for a sustainable development of seaweeds". Seaweeds are increasingly used worldwide with an annual production increase of ~ 7%. The demands for high-value seaweed-derived compounds are increasing in Europe and importation is high. However, Europe lags behind Asian countries despite its largest exclusive economic zone, its high seaweed biodiversity, and its international leadership in fundamental research on macroalgae. The work carried out under these guidelines aims to identify the reasons for these delays. It is based on our long experience in crop production and domestication in general, as well as on current European and global marine ecological, climatic and commercial contexts. The Phycomorph expert group intends to propose balanced and long-term recommendations based on a detailed analysis of current seaweed aquaculture practices, regulations, health benefits and consumer demands, with a focus on the protection of the marine environment. These guidelines, fully in line with the recommendations of the United Nations Policy Brief (Cottier-Cook et al., 2016), are also intended to include the opinions and analyses of as many experts as possible from the academic, private and voluntary sectors, mainly in Europe but also on other continents. We believe that such a broad basis, beyond the difficulties of avoiding a tepid and non-impact document, will ensure the production of a solid and forward-looking reference document, which is intended to provide a reliable basis for the development of this sector in Europe. These guidelines should be considered as scientific advice from the PHYCOMORPH community and friends in order to help all stakeholders in this sector to understand the different aspects of seaweed aquaculture for sustainable development in Europe and to involve producers, decision-makers, national authorities and scientists in an in-depth reflection on this topic. To contribute, please register to download the guidelines and complete the associated document with your own contribution (comments and associated literature) chapter by chapter until 20 JANUARY 2019. We inform you that we will acknowledge your authorship if your contribution is relevant to PEGASUS. The objective of your contribution is to reinforce these guidelines which, once validated, will be accessible for all and will be presented at the European Parliament on 26 February 2019. More details to come. The deadline for contribution is 20 JANUARY 2019. A first presentation of PEGASUS has already taken place at a Stakeholder Event at the COST office in Brussels on 21 September 2018. Of course, we take data protection very seriously; you can take a look at our privacy notice for all the details. We inform you that once PEGASUS is published, the acknowledgment of authorship of the contribution cannot be retrieved. We ask therefore for your attention on the following: Should you oppose to acknowledgment of authorship of your contribution, we would be grateful if you could mention it explicitly in your email to "consultation.pegasus at gmail.com" in response to this collection of contributions. Without such a mention, the contributions will be authored.